Chris Brockis had been having trouble mixing in his attic home studio, so he enlisted the help of the trusty SOS team. Most of the work Chris does is in collaboration with other musicians, and he's currently working with Francis Firebrace, a charismatic story-teller/songwriter from Australia, and Mick Rogers, the guitar player with Manfred Mann's Earthband. Mick's own material, which features not only his distinctive guitar playing but also some excellent vocals, normally starts out in Mick's own home studio and is then transferred to Chris' Cubase SX setup for completion and mixing. For Mick's forthcoming album, they wanted to be able to record direct to Cubase in order to improve the creative process and the overall quality of the finished product. Chris realised that the existing environment needed to be improved, particularly in terms of monitoring and layout, but on a limited budget the improvements would need to be prioritised. So Chris called SOS for help. The studio room is rectangular, but with a flat-topped apex roof (50-degree pitch) coming to within around 1.2 metres of the floor on either side. Chris had his monitors set up at one end of the room, where the wall is a little under 3.5m wide and the full length of the room behind him is 5.8m, with the spiral staircase emerging close to the rear wall. Given the dimensions of the room, this orientation for monitoring seemed the best bet. Chris was mixing on a fairly old pair of KEF Concord hi-fi speakers, which were perched on fairly wobbly stands that placed the tweeter below the ideal ear height — presumably these were designed for 'easy chair' listening. They were also positioned at each end of his equipment desk, and angled to focus a metre or so behind Chris' chair, so he wasn't getting a very accurate sound picture. A pair of JBL Control 1s were wired in as a secondary reference, but Chris didn't have a speaker switcher and so had to change cables over every time he wanted to change monitors. He had also wound in a huge amount of bass boost when using the JBLs to try to compensate for their inherently shy bass response, with the expected result of a very muddy and tuneless bass end. A cursory glance around the recording hardware showed that much of Chris' gear had been accumulated during the '80s, as there was an old Yamaha SPX90, an Aphex Type C Aural Exciter, a Yamaha FX800 multi-effects box, a Yamaha GC2020 compressor and a Korg M1R rackmount synth. The biggest chunk of hardware by far was a Tascam 388 combined open-reel eight-track recorder and mixer, which Chris was now using mainly as a mixer. Aside from the 388 mixer, very little of this gear was now used, as Chris tended to record, manipulate and mix everything inside Cubase SX (including adding effects and reverb), which was running on an extremely quiet Syrinx PC put together for him by Andertons Music. The audio interface was an Edirol DA2496. Chris was keen to optimise his work space, so Hugh suggested that the 388 recorder/mixer be moved to the left-hand wall, which would give Chris more room for his computer equipment and, more importantly, allow the monitors to be positioned more appropriately. His master keyboard could then be positioned immediately to his right, so that he could get to it simply by swivelling his chair. However, before changing anything, we wanted to get an idea of how his existing monitoring system sounded, so we played some of his mixes and compared them with a Sting CD played through the same system. Although not terrible, the KEFs sounded somewhat dull and unfocused and had no real depth of bass, which meant Chris was using EQ to compensate for the speaker deficiencies, more than to correct his mixes. Chris had already told us beforehand that he was using hi-fi monitors, so I brought along the Mackie HR624s that normally provide the rear surround monitoring in my own studio to see if they sounded any better. Chris said he'd already tried these Mackie speakers in a music store and thought they didn't sound particularly great, but as music stores are not the best place to audition speakers, he agreed to give them a try. In the absence of stands, we fixed them to the tops of the KEFs using blobs of Blu-Tac, then moved the KEFs further back and angled them in to establish a more traditional 'monitoring triangle'. On replaying the same tracks, the Sting CD sounded much more crisp and precise, with a nice tight, tuneful bass end. On the other hand, Chris's mixes sounded rather bass heavy, confirming our suspicion that he'd been misled by his monitors. Chris agreed that the Mackie monitors sounded great in his room, so we left them set up for the rest of our visit and Chris soon added them to his monitor short list. We also suggested some hefty speaker stands around one metre high, which could either be commercial hi-fi stands, ideally filled with sand, or (as he was obviously handy with tools) he could make a pair of wooden stands similar to those I use in my own studio — I discussed this design in detail back in SOS November 1995.
the speaker visible from your monitoring position, that would be where you'd put the centre of your foam panel. It can also help to do the same with the ceiling, but because of the sloping angles in Chris's room, reflections weren't such a serious problem, so we decide to try it without. However, we did feel that a further panel in the middle of the front wall, between the monitors, would help a little, as otherwise there was a risk of getting 'secondhand' reflection from the flat hard surface, a little over a metre in front of the mixing position. And, of course, no Studio SOS would be complete without a duvet, so to tame the back wall a little, we suggested the simple ploy of fitting a curtain pole and then draping a king-size duvet over it. Yes, this is a pragmatic approach rather than a calculated solution, but when you're on a tight budget, a little low-tech treatment can make a significant improvement to an otherwise indifferent room. We also suggested draping a duvet behind the vocalist when doing vocal recording, so Chris, being ever resourceful, said he'd build a suitable frame out of copper plumbing pipe and use that to hold up the duvet. Because Chris' room looked so nice and new, we didn't want to do anything too permanent to it, so instead of sticking Auralex foam panels directly to the wall, we wedged them roughly in place just to test the result, then suggested to Chris that he fix them to MDF boards and then fix those to the wall using hooks. That way, if he decided to rearrange the studio at some future date, he wouldn't be left with patches of adhesive on his paintwork. 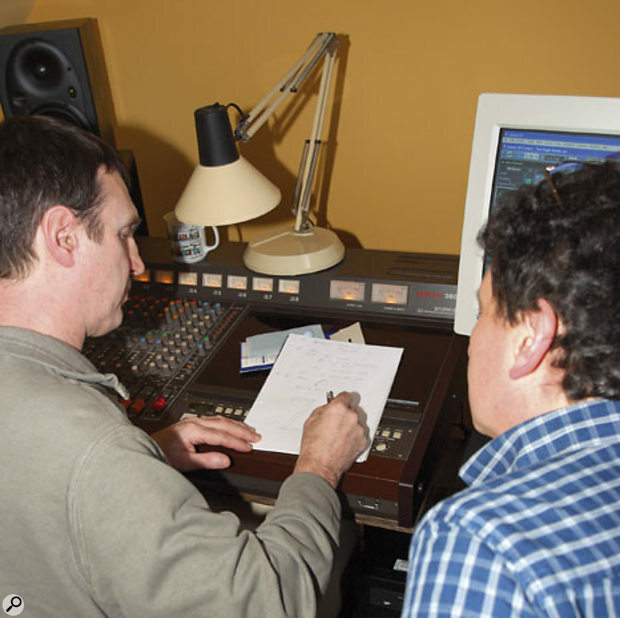 Once we had the monitoring behaving adequately well, Chris asked us to advise on some issues relating to his mixes. His first question concerned the use of Antares Auto-Tune, where he was using it to pitch-correct some layered vocal harmony parts. He'd set up the correct scale, but on some of the parts the pitch-correction was too fast, resulting in that familiar quantised, vocoder-like sound. He'd also used the vibrato feature of Auto-Tune to add a little artificial vibrato after a short delay. We managed to improve things by setting the correction speed control to around the halfway point, which still held the tuning, but without taking away all the natural inflections of the voice. What's more, as the natural character of the voice was better able to get through, the addition of artificial vibrato became less necessary, so we were able to reduce the vibrato depth on some of the parts. We also staggered the vibrato delay times on the different plug-ins to create a less regimented effect, and varying the vibrato rates slightly is a good idea too. As a rule, always use as little Auto-Tune as you can get away with if you want the most natural-sounding vocals, though you can generally afford to use it a little more heavily on backing vocals than on lead vocals. Here you can see the mix processing settings used to polish Chris's mixes. The other mix issues concerned EQ and dynamics, two common areas of concern. 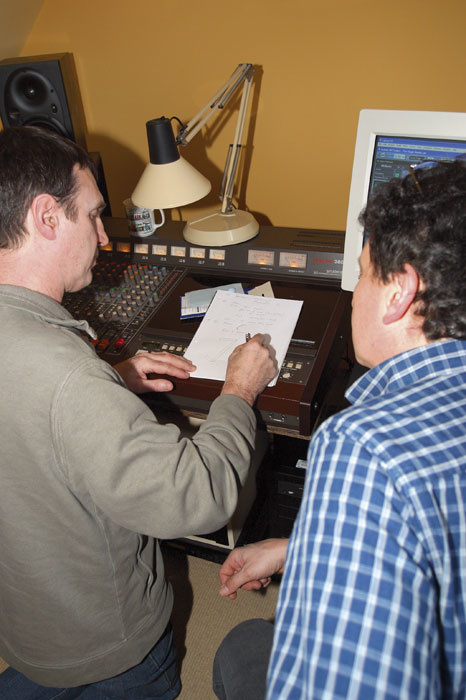 When working with Mick Rogers, Chris usually took a stereo mix of a part-finished track from Mick and then added further parts, but he'd also been adding a lot of EQ to the original stereo track, partly to compensate for his monitors. Once we had the monitoring sorted out, we needed less drastic EQ, and in some cases Chris had been using large amounts of EQ with quite narrow bandwidths, which almost always sounds unnatural. Instead, we created a gentle smile curve by boosting at 80Hz over a wider range to bring out the bass drum and bass parts, cutting the lower mid-range at 180Hz and then adding in some high-end sizzle at 12-14kHz with a wide (low-Q) setting. The amount of cut and boost we had to add using the Cubase SX Channel EQ plug-in was rather more than you'd expect if you were using an analogue equaliser and, as every digital equaliser behaves slightly differently in this respect, it's impossible to give a recommended amount for other systems. 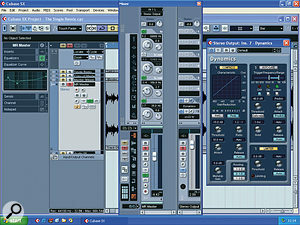 However, the screenshot shows what we ended up with on Cubase SX. The result of applying this smile curve was to add a little weight to the low end while clarifying the mid-range and adding more definition to the high frequencies. Despite the apparently drastic-looking EQ curve, the amount of change when bypassing the effect was still quite subtle. We had noticed that handling Cubase SX on a single 19-inch CRT monitor was a bit of a pain — we were forever opening and closing windows, so we suggested that a double-headed graphics card and two 15-inch or 17-inch LCD screens would be more useful, as he would be able to leave multiple windows open and, as a bonus, he could record electric guitar without the monitors causing buzz — a particular problem, as Mick plays a guitar fitted with single-coil pickups. The CRT was also very bulky and was potentially causing imaging problems because of reflections. LCD monitors are far less intrusive in this respect. Chris also wanted to know how best to apply dynamics processing to the final mix. 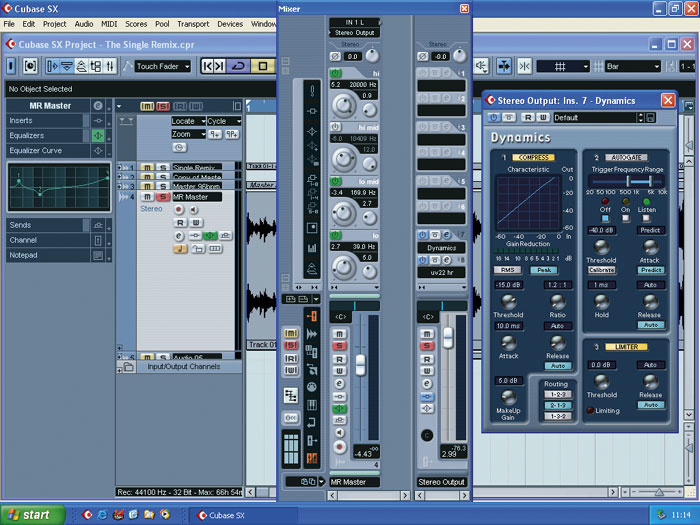 I first tried the Cubase SX multi-band compressor, but I could find few of the parameters I was expecting. There seemed to be an overall graphical control that affected the amount of compression in all three bands at once, and it was easy to change the crossover frequencies and the gain in each of the three bands, but I couldn't find the rest of the parameters I was familiar with, so I used the full-band compressor in the dynamics section instead. To increase the density without squashing the track, I set a low threshold and a ratio of just 1.2:1, then fine-tuned the threshold to give in the order of 6dB of gain reduction on the signal peaks. This particular processor has an automatic release function, which seemed to work fairly well so I left it on, and I set the attack time fairly fast. If you find that transient percussive sounds are losing their definition, you can increase the attack time to 20ms or so, but with such a low ratio, we had no problems of this kind. Having tried these overall fixes, we identified some balance and EQ problems in the original stereo mixes that could be better resolved at the mixing stage, and suggested that Mick brought his mixes over as separate tracks rather than as a simple stereo submix. Chris agreed that this is how they intended to work for Mick's forthcoming album. They'd already ended up resorting to strategies such as layering on another kick-drum part because the one in the stereo mix lacked power or definition. Being able to fix or replace the original part prior to mixing would be much more satisfactory. There were also some arrangement issues, especially on a track Mick had written called 'U Don't Love Me' where his vocals sounded uncannily like Peter Gabriel (the track featured a distinctive drone part created by detuning the guitar by four semitones and then processing it via distortion and a wah-wah pedal). This was a great song, well played and well sung, but the drum part featured a wall-to-wall splashy ride cymbal that stole all the space from the mix. This could have been replaced with a duller or more percussive type of cymbal like the Zildjian Earth Ride, or even omitted altogether. Chris had also tried using the Cubase time-stretch facilities to fix the tempo of a slightly slow mix that Mick had brought over, but even though the amount of tempo increase was modest I could still hear the time-stretching artefacts, which had the effect of clouding the mix and making it sound messy — something that was much more evident when heard over the Mackie monitors. It should have been possible to do a better job using a more sophisticated third-party plug-in to do the time-stretching, but where you have the time to start over and get the tempo right, I feel it's very important to do so, especially when you're trying to process a significant chunk of the mix and not just the odd track. "It was great to meet Paul and Hugh. Their expertise has helped me to create a much improved studio environment relatively cheaply, barring the expense of new monitors, of course! When I first set up the room in 2002 I knew that improvements would be required, but I didn't know where to start and where the major gains were to be had. "After a cup of tea (and some chocolate biscuits, of course! ), Paul plugged in his Mackie HR624s. I was amazed at the improvement over my KEFs. Then, with the Auralex strategically placed, I was astounded by the improved clarity of the soundscape. I had not expected such a major improvement from just a couple of panels! When Paul and Hugh left I had a clear idea of what needed to be done. I had just two weeks to complete everything for their next visit during the Sounds Expo show. "The biggest issue for me was monitor selection. Before the visit, I auditioned most of the current crop of monitors, including the HR624s, at my local music shop. At the end of the session I was none the wiser as to what would be appropriate in my studio and I was reluctant to part with the readies. I was also surprised at how the same speakers could sound so different with music of different genres. One particular pair sounded clear and articulate with simple pop and R&B, but couldn't handle more grungy rock music at all. On the basis that Paul's Mackies sounded great in situ and handled all genres well, I decided to go with them. I had intended to build Paul's design for wooden stands, but finally went for sand-filled Atacama Nexus 10s. "The shape of the roof made designing the suggested 'duvet vocal booth' screen a bit awkward. My wife Caroline's inspired suggestion was to try the chrome clothes rail in our spare bedroom — it's adjustable in height, collapsible, and only cost £6.40 from Argos. However, I found that it was not quite tall enough, even at its maximum extension. As luck would have it, though, the upper vertical tubes can be replaced cheaply by longer lengths of 22mm standard copper pipe. I bought two clothes rails and some copper pipe for less than £25! The rails are linked at the top for stability and I have put 45-degree bends in the horizontal pipework to make the screen semicircular. I also bought a 13-tog king-size duvet, with a cover to match the Auralex foam, so it all fits together rather well. "The equipment has been moved around as suggested by Hugh. 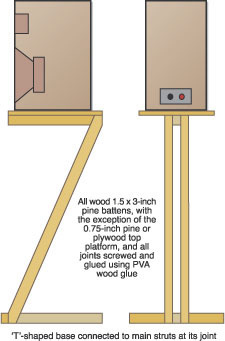 The PC workstation surface has been extended with an offcut of 38mm worktop, which cost £6. The original BT patchbay has gone in favour of a Behringer 48-way TRS patchbay. I have added a separate workstation for my Atari sequencer and there is plenty of space for Mick's 24-track digital recorder and outboard gear. The overall improvement is nothing less than amazing, both acoustically and ergonomically. 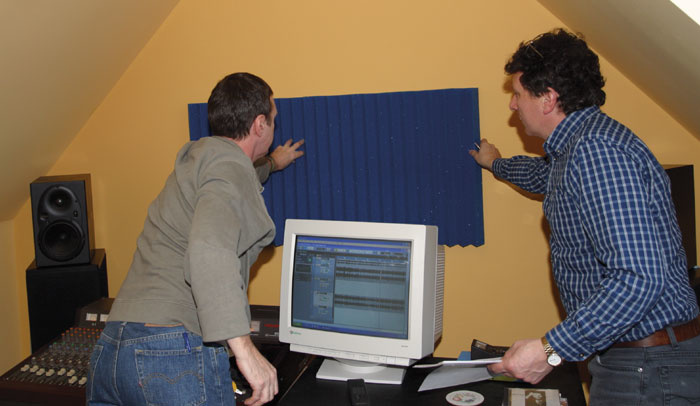 The improvised recording booth has noticeably improved both vocal and acoustic guitar recording. Mixing and monitoring is now a delight. Another job well done guys! "Incidentally, Mick has been singing for as long as Peter Gabriel, and has appeared on about 20 albums, so I sometimes think that Peter Gabriel sounds uncannily like Mick Rogers, rather than the other way around..."
Chris agreed to sort out some new monitors and stands as well as rearranging the gear and fixing the foam tiles so that we could visit him during the forthcoming Sounds Expo show in London to photograph the finished job — find out how things turned out in the 'Chris's Comments' box. We got a feeling of déjà vu as we left, because this time last year we left a Studio SOS visit in South London and drove straight into the worst blizzard of the year. This time we managed to get as far as the M40 before the rain turned to snow, and before long we were crawling home at 10mph with cars and lorries slipping and sliding around us. Such fun!